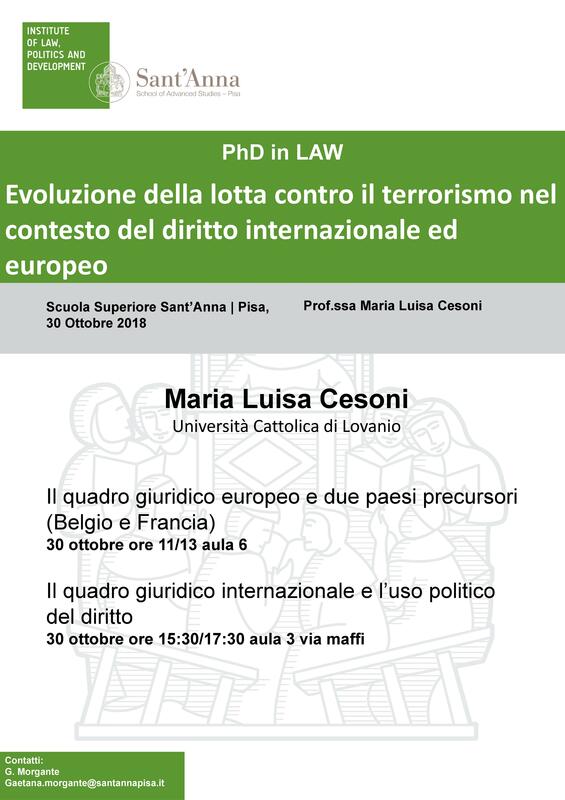 On the 30th of October, Maria Luisa Cesoni, professor at the Università Cattolica di Lovanio and member of the PhD Faculty, will give two seminars on the evolution of the fight against terrorism within international and European law. In the morning (h. 11-13, main campus, room 6), she will talk about "Il quadro giuridico europeo e due paesi precursori (Belgio e Francia)"; in the afternoon (h. 15:30-17:30, via maffi, aula 3), the class will discuss "Il quadro giuridico internazionale e l’uso politico del diritto". The program of the event can be downloaded below.